Kotondo, Torii (1900-1976) "Summer Geisha" - Woodblock - Chinese and Japanese woodblock prints for sale, silkscreen, scrolls, watercolor, lithographs. 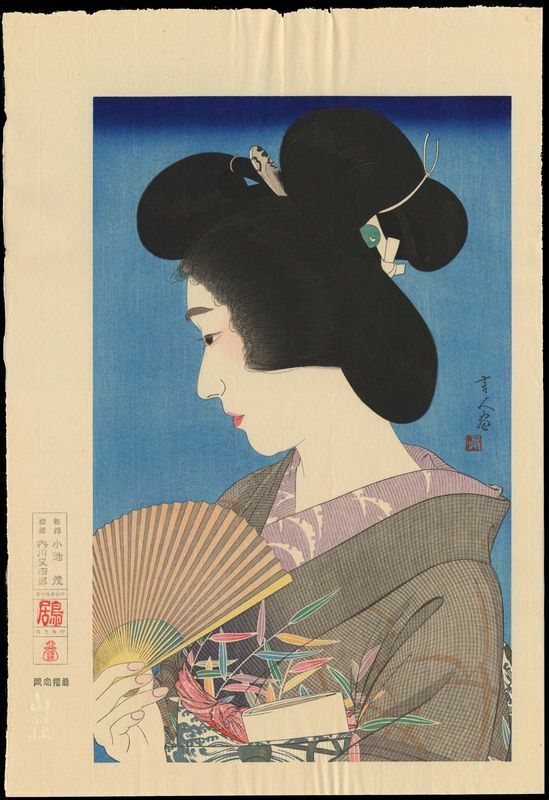 Artwork Details for Kotondo, Torii (1900-1976) "Summer Geisha"
Condition: Pristine condition. No flaws. Full margins. No tears, folds, foxing, creases or stains. Lovely light mica finish to fan and light embossing to fan ribs and kimono. Fine paper texture, excellent colour, impression and ink penetration. Never been framed. Notes: This print has Kotondo's signature and seal within the image area; Printer and carver seals, red Torii artist's seal, red publisher's `moneybag' seal (left margin); Watermark in lower left margin. Nearly double-oban in size. Limited edition published circa 1980s. Carver: Koike. Printer: Watanabe.